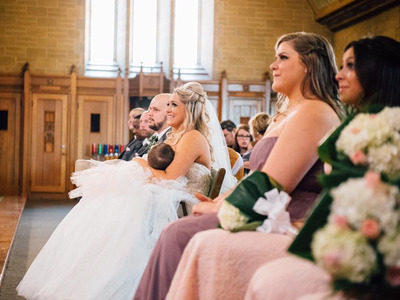 A photograph of a bride is going viral — not because she looks lovely in her dress (though she does), but because she’s breastfeeding her child during the wedding. Christina Torino-Benton was getting married to her husband Danny in Montreal earlier this month when her 9-month-old daughter, Gemma, got hungry. The baby started to cry, and Torino-Benton quickly knew what had to be done. “I tried for maybe two minutes to allow some family members to calm her down, but having missed her nap, and in that heat, it wasn’t going to happen,” the 30-year-old told People. Torino-Benton shared a photo of her breastfeeding taken by wedding photographer Lana Nimmonduring the ceremony to the Facebook group Breastfeeding Mama Talk, where it’s racked up almost 8,000 likes.